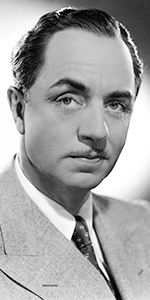 William Powell was another 1930s cinema hero for audiences all over the world. Urbane and witty, almost continually (as in the Thin Man films) plastered, yet with sharp commitment, Powell starred in 14 films with Myrna Loy, who became his perfect sparring partner. Powell had an idyllic childhood in Pennsylvania, then attended high school in Kansas City, Missouri. At age 18, Powell left home to attend the American Academy of Dramatic Arts in New York City. Graduating in 1912, Powell went to work in stock companies and in vaudeville. Powell made his Broadway debut in The King in the 1917-1918 season. By 1920, Powell had the lead in Spanish Love, which was decidedly a farce, with Powell declaring in the aisles and stage boxes, calling his rival a "cabbagehead." It ran for ten months. Like many Broadway oerformers, Powell took a whirl on the movies, initially playing a bit part in Sherlock Holmes with John Barrymore (1922). Powell rose quickly, playing King Francis I in the creaky Marion Davies costume epic When Knighthood Was in Flower (1922). Powell played third or fourth billed roles in various Paramount films, including Beau Geste with Ronald Coleman (1926), and The Great Gatsby with Warner Baxter (1926), where he played George Wilson, the garage owner(!). But in his first really big role, in The Last Command (1928) with Emil Jannings, Powell finally clicked. Cast as detective Philo Vance in The Canary Murder Case (1929), Powell mirrored S. S. Van Dine's foppish dog-fancying sleuth to perfection. Powell would play Vance in four films. But it would be another detective character, Dashiel Hammett's Nick Charles, that Powell would be forever associated with — The Thin Man — opposite Myrna Loy in 1934. The unexpected success of the boozy couple, brought not only a string of follow-ups, but with Powell and Loy teaming together in non-Thin Man films. Manhattan Melodrama (1934), Evelyn Prentice (played the Chinese in December, 1934), and The Great Ziegfeld (played the Chinese in November, 1936). After starring in My Man Godfrey with his ex-wife Carol Lombard in 1936, perhaps the best of the Powell / Loy films apart from the Thin Man films had just played the Chinese the week before their footprinting — Libeled Lady. By this time, Powell and Loy knew the fun-loving reputation the team had, so they both showed up for the ceremony wearing over-sized clown shoes saying that they "wanted to make a big impression." Powell was involved with Jean Harlow at the time of the filming of Libeled Lady. When she passed away in June, 1937, Powell was devestated. He took a year off from the pictures, returning in Another Thin Man (played the Chinese in November, 1939), followed by Shadow of the Thin Man (played in November, 1941). During World War II, Powell's film appearances became more infrequent; he reprised his role as Florence Ziegfeld in Ziegfeld Follies (1945), did two more Thin Man movies, The Thin Man Goes Home (1945), and Song of the Thin Man (1947). He bagged a Best Actor Oscar nomination for Life with Father (1948), and appeared as a dapper older sutor to Lauren Bacall in How to Marry a Millionaire (1953). His final film was the fantastic adaptation of Mister Roberts with Henry Fonda and James Cagney. Powell then retired to the life of Palm Springs, where he died peacefully in 1984 at the age of 91. Grauman's Chinese Theatre, Hollywood, California. William Powell / Myrna Loy Forecourt ceremony, Wednesday, October 20, 1936. 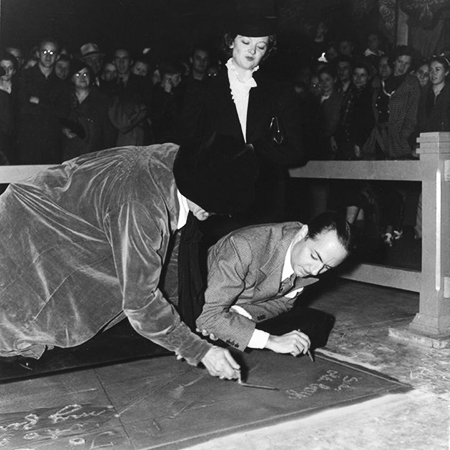 Myrna Loy (who seems to have gone first), overlooks as Powell writes his inscription with the assistance of cement artist Jean Klossner.